Click the picture to see a larger image! Each December, Murphy First Baptist Church in Murphy NC hosts the Singing Christmas Tree. What a show! 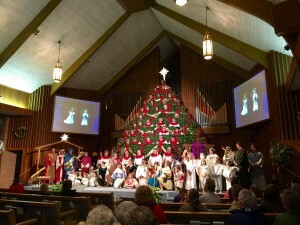 The choir fills the stage shaped as a Christmas Tree. Throughout the well produced production, there is a live nativity scene, beautiful singing and solos, angels, and so much more! When you’re in Murphy NC during the holiday season, it’s a treat to be able to enjoy the show. It is only offered for a few days, so make certain you don’t miss it! You can check their website by clicking the link above or calling them at 828-837-2615. It’s easy to find – it’s directly across from McDonald’s. Enjoy the show!